Our GAS IT SKY©, Self Refillable gas bottles are easy to use, save you money and are super convenient to use and fill up, with LPG Gas Locker Triangle Sticker. All our GAS IT direct fill portable / Freestanding bottles come with the required TPED and Pi markings and also with the required outlet tap sealing cap for sealing the outlet tap and also a separate inlet fillpoint seal when the bottles are not in use plus every bottle is fitted with top quality German manufactured OPD - Overfill Protection Device as standard. Well one of the main advantages over a single valve portable bottle is that all GAS IT bottles have 2 separate valves - A fill point with integrated Overfill Prevention Device ( OPD ) and a separate outlet tap, so whilst you can remove a GAS IT portable bottle for standalone refilling, you also have the easy option of simply driving up to theAutogas filling station and you do not have to disconnect a pigtail from the bottle to refill ( as you do on bottles with a single combined valve ). With GAS IT portable bottles, just drive up and put the fill gun on the bottle as there is no need to disconnect every time. 3) Refill with ease using everyday Autogas. 5) Indication of gas level. 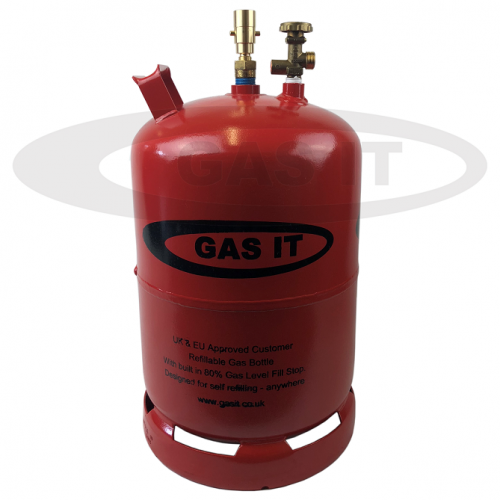 This GAS IT bottles come with our GAS IT SKY© Fill point fitted so you can fill with ease directly on the bottle. These items are our own, manufactured GAS IT branded stock. Whilst filling directly on the bottle is recognised with the right approved gas bottles and accessories, some LPG forecourts and Autogas service stations might not allow this practice in their own terms and conditions and we have no control over this. We can also not confirm if you are allowed to fill these types of bottles outside of the UK.